The California Agricultural Mediation Program (CALAMP) is the official United States Department of Agriculture certified agricultural mediation program for California. 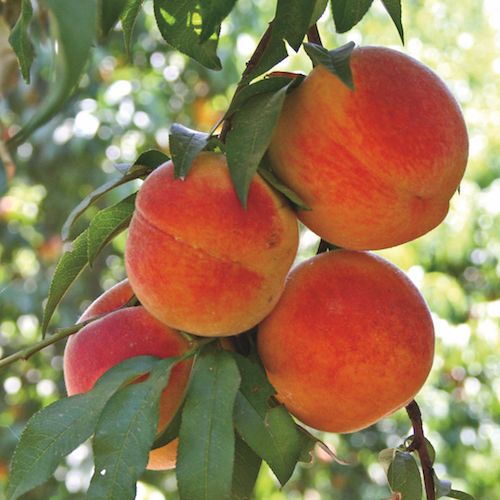 CALAMP’s services are free to the agricultural community on many issues. Mediation is a way to resolve disputes using an impartial person to assist parties negotiate their differences. For additional background information about mediation, click here or watch the video to the right. 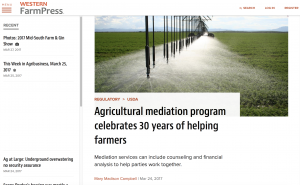 The California Agricultural Mediation Program provides free mediation services to the agricultural community on many issues. Mediation is an informal and fast way to resolve problems and I encourage you to contact them if you need assistance. The program is certified by CDFA and USDA. 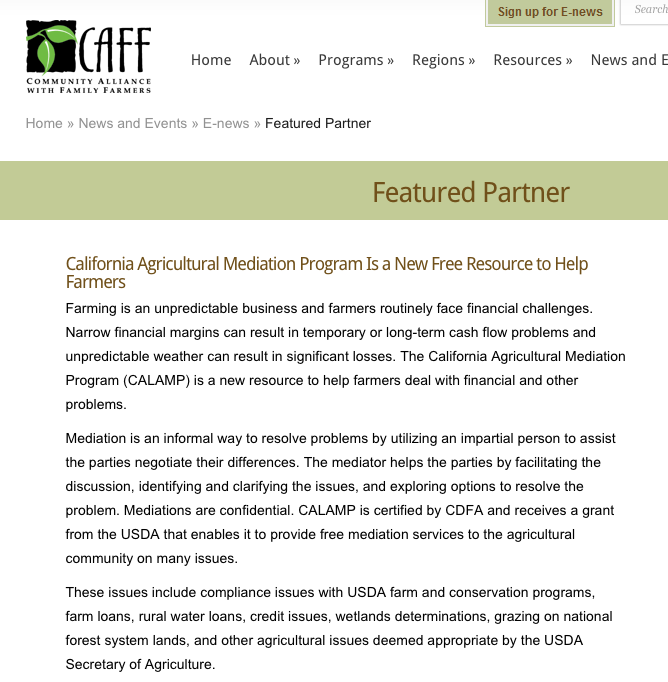 CALAMP provides free mediation services to the agricultural community in California on the issues listed above. For other agricultural issues, CALAMP will provide the mediation services free of charge when other funding sources are available. In some cases, CALAMP may ask parties to pay based on a sliding scale. CALAMP staff will confirm that the other party (or parties) is willing to participate in the mediation. CALAMP staff will conduct brief confidential interviews to learn background information about the dispute. CALAMP will assign a mediator from the Agricultural Mediation Roster or CALAMP staff based on subject matter expertise, geography, and availability. Please complete the form below to request mediation from the California Agricultural Mediation Program. If you would rather print the form and mail it to us; click here. Once your request has been received we will review your information and contact you. You’ll also need to fill-out and submit the CALAMP Release Form. John Bailey is a California licensed attorney at Alternative Dispute Resolution, APC, based in Salinas, California. John regularly mediates agriculture-related disputes related to land use, the Perishable Agricultural Commodities Act, commission agreements, and leaseholds. John regularly acts as an advocate for small to mid-sized farmers and ranchers, and a variety of agriculture-related businesses before local City Councils, County Boards of Supervisors, and various Administrative Agencies. John earned a Bachelor of Science degree in Biology from George Washington University, and a Masters in Business Degree from the University of Miami. John has had extensive professional training in the art of negotiation, and mediation, including a Juris Doctor degree with an emphasis in Advocacy and Dispute Resolution from Chapman University. Misha Bailey is a program manager, facilitator and mediator, with over 13 years in the agriculture, food systems, environmental and public service field. Misha grew up in northern California on a small family farm, and has spent years working with livestock, food crops, forestry and native plants. She is an assistant facilitator with California’s Center for Collaborative Policy, and is also the founder and director of Durable Solutions, a northern California based collaborative problem-solving firm. Misha has also mediated in Vermont courts, designed collaborative processes for public entities and nonprofits, and worked for the State of Vermont as the lead Natural Hazard Mitigation Planner. She has years of experience in public service and is well versed in federal and state programs, including the NRCS CREP program. She has a Bachelor of Science from UCBerkeley, and a Master in Environmental Law and Policy from Vermont Law School, where she specialized in dispute resolution. Lisa Ballin brings over 20 years of environmental consulting experience to her work as a mediator. She has addressed agricultural issues related to land use compatibility, farmland conservation, air quality, noise, and odors. She has also directed permitting and compliance work, including biological assessments and wetland delineations. Lisa received her mediation training at the Ventura Center for Dispute Settlement and the US Institute for Environmental Conflict Resolution. She has mediated at Ventura and Los Angeles County Superior Courts and for the Inland Valleys Justice Center, including numerous debt resolution cases. She is an assistant facilitator with the Center for Collaborative Policy and a member of the Southern California Mediation Association. Lisa earned a Bachelor of Arts in mathematics from the University of Pennsylvania and a Master of Science in Engineering-Economic Systems from Stanford University. Mark brings over thirty-five years of business experience to the table when he assists people in resolving conflicts. A large part of that experience includes deep exposure through his family to big and small family farms, agriculture, and manufacturing. He has worked as a facilitator and mediator in Fair Trade farm situations, farmer health matters, and cooperative food movements. Mark’s specialty is working with teams in conflict, especially when the stakes are high and relationships, community, and/or a business hangs in the balance. His mediation methodology is based in a model that insists that the parties make the decisions about substance while he runs the process that surfaces the choices. Mark holds a Master’s degree in Mediation and Conflict Studies from the Woodbury Institute at Champlain College as well as a Business Management undergraduate degree. He has worked as a mediator with family and non-family teams throughout California, the US and Europe. Mark is an avid husband, entrepreneur, trail runner, and hunter (most of the time, in that order). Joleen Borba has a life-long association with agriculture. She was raised on a dairy farm and currently works in the citrus business. Joleen has been a member of the California Bar since1981. Her practice focused on business law and litigation. She eventually assisted her father administering his dairy farm, attended meetings with suppliers; prepared employee handbooks and reviewed employee files; managed finances; wrote and reviewed contracts; and dealt with city, county, and state regulators. Joleen is currently a co-trustee for a company that owns commercial property, a citrus packinghouse, and several hundred acres of citrus property. She is an experienced mediator and is pursuing an LL.M. in Dispute Resolution at the Straus Institute at Pepperdine School of Law. Donald (Don) Cripe is a retired trial lawyer; a professionally trained senior mediator with 18 years’ mediation experience; and a mediation trainer and adjunct professor of law who teaches mediation and negotiation to law students. Mr. Cripe has logged nearly 4000 mediations involving a wide variety of issues from very basic to extremely complicated. Mr. Cripe grew up in rural Indiana, lived a substantial time in his youth on a family farm, and maintains family roots in farm country. He is conversant on and sympathetic to many issues that the agriculture industry faces. 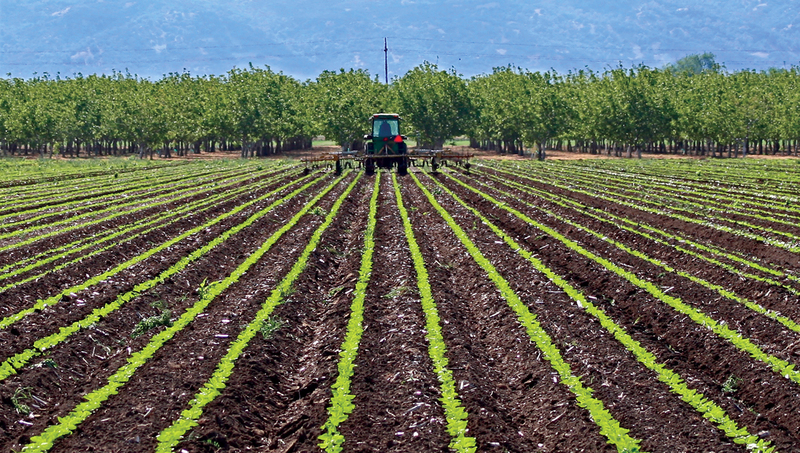 Mr. Cripe has mediated and arbitrated cases involving agricultural land and other related issues. Donald Fischer received a Master’s Degree in Conflict Studies and Peacemaking from Fresno Pacific University (FPU). He is an Advanced Practitioner Member of the Academy of Family Mediators of the Association for Conflict Resolution and has contracted with the County of Fresno Court as a research consultant and advanced mediation trainer. Donald serves on the California Bar Association, Litigation Section, ADR committee (co-chair 2012-13). Additionally, he has extensive exposure to the issues faced by the farming industry, in part through his 35+ years as a shareholder in an Exchange Water Contractor. 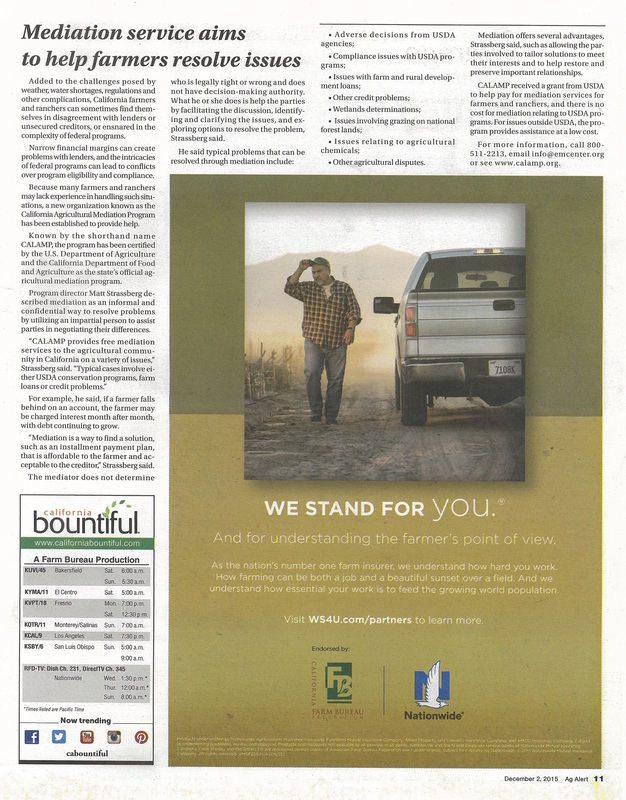 Fresno County Farm Bureau’s FAACT program exposed Donald to issue areas specific to agriculture. Julia Rose Golomb is a mediator and facilitator with expertise in water, agriculture and food systems. Julia’s mediation practice focuses on environmental planning, resource management, and environmental justice. She is a Senior Associate with the Consensus Building Institute and holds a Masters of Environmental Management from the Yale School of Forestry and Environmental Studies. Julia served as a Teaching Fellow for the following Yale graduate-level and undergraduate courses: Environmental Mediation, Negotiation and Facilitation; Financial Concepts for Environmental Professionals; The Psychology, Biology, and Politics of Food; Women, Food and Culture; and The History of Food. Julia previously worked on agricultural policy with PepsiCo and the Union of Concerned Scientists, mediated in the Boston court system, and has farmed in Boston, Greece and South India. Lan Nguyen received her J.D. and Certificate in Dispute Resolution from Chapman University, School of Law in 2002. Ms. Nguyen is fluent in Vietnamese and currently provides private dispute resolution and legal services through Esquire Consulting, Inc. She is also panel mediator for the Orange County Superior Court, and Pacific American Dispute Resolution Center in Los Angeles, as well as a Sustaining Member of the Southern California Mediation Association. Ms. Nguyen currently splits her time between Southern California and the Central Coast, where she developed an interest in wine and agriculture. In 2008, Ms. Nguyen familiarized herself with the basics of wine law, including grower’s liens and negotiations of grape purchase agreements and vineyard leases, by taking a Wine Law Forum class sponsored by the State Bar of California. Ms. Nguyen provides mediation services in the Counties of Los Angeles, Orange, and Santa Barbara. Larry Whitted is a graduate of the University of California at Berkeley and has 17 years of experience as a professional mediator mediating agricultural and workplace disputes throughout California and Nevada in English and Spanish. He uses a “facilitative” approach to mediation in which the participants retain all decision-making power. In addition, Larry has 36 years of experience as a licensed pest control adviser working primarily with permanent crops in California. In 2015 he also became a Certified Crop Adviser. Briana holds a B.S. from the University of California, Santa Cruz, where she studied Plant Sciences, with a focus in agroecology and sustainable agriculture. She holds certificates in mediation and public engagement, and brings five years of experience developing and implementing conflict management solutions for large-scale natural resource issues as an associate for Kearns & West, a Bay Area firm. Her projects included tackling high-stakes local, state, regional and national issues in water, energy, marine resources, and land use. In addition to her formal training, Briana brings over 12 years of experience as a 7th-generation co-owner and manager of her family’s 680 acre timber and cattle farm in Virginia. Most recently, Briana can be found applying her foundation in biology and agriculture to the making of artisan cheese for Cowgirl Creamery in Marin County.